A Londonderry shop has asked customers not to shop in their pyjamas or onesies. 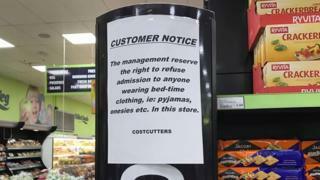 Notices have been put up in the Costcutter supermarket at the Ráth Mór shopping centre in Creggan. Management said it would: "Reserve the right to refuse admission to anyone wearing bed-time clothing i.e. pyjamas, onesies in this store." Shop staff said the sign had been up "for some time". The BBC have asked Costcutters for a statement. Earlier this year, Tesco 'shrugged off' a complaint from a customer to ban shoppers wearing nightclothes in its stores.